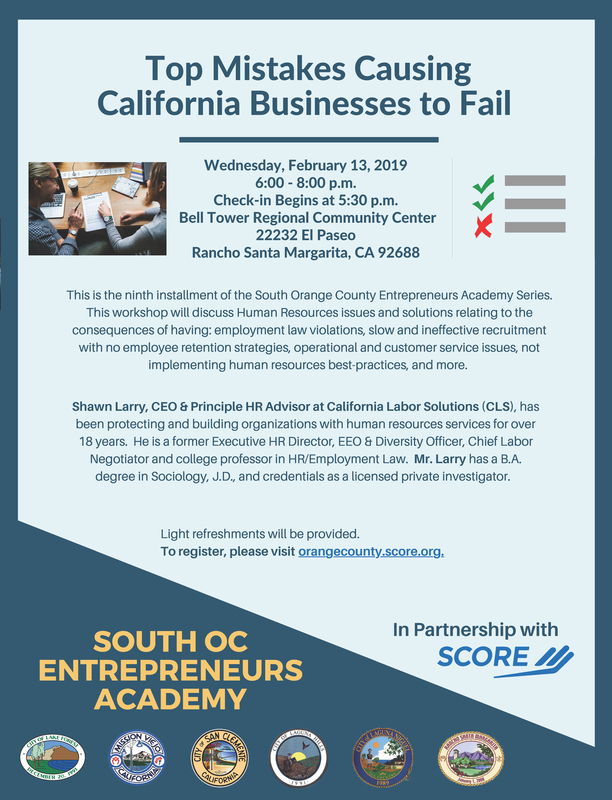 The Ladera Rancho Chamber of Commerce has partnered with the City of Lake Forest and SCORE to bring business owners and entrepreneurs the South Orange County Entrepreneurs Academy, a series of FREE workshops in 2018 and 2019. Businesses fail for a lot of reasons - many of which are preventable! This is the ninth installment of the South Orange County Entrepreneurs Academy series. This workshop will discuss human resources issues and solutions relating to the consequences of having: employment law violations, slow and ineffective recruitment with no employee retention strategies, operational and customer service issues, not implementing human resources best-practices and more.